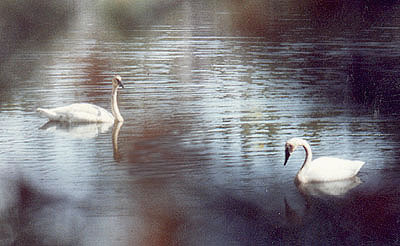 Trumpeter Swans began wintering in the San Juan Islands in the 1970s when the mainland population began to recover. Historically, prior to the 19th century, Trumpeters may have nested on the island, but there is no known record. Today the wintering population is fairly stable at about 45-55 birds. Our population of Trumpeters breed and nest along coastal British Columbia and Southeastern Alaska. Photo by Richard W. Wright.